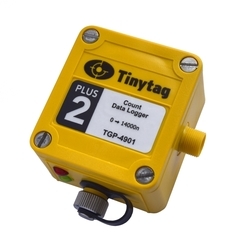 The TGP-4901 is a count input data logger that is supplied in a robust, waterproof case. It records the number of pulses seen during each user-defined logging interval. Loggers can be factory configured for use with a third-party sensor, for applications such as flow rate, utility meters monitoring and object/people counting. To confirm that this logger can be configured to work with a specific sensor, please contact us using our online form. This logger requires Tinytag Explorer software and a USB download cable (CAB-0007-USB). The logger is supplied with an input lead (CAB-3246) to connect it to a third-party sensor. For sensors that already have an output cable, a 2-pin connector plug (ACS-9700) is available separately.